Kelleners Sport proved you can improve on perfection and here’s their proof! 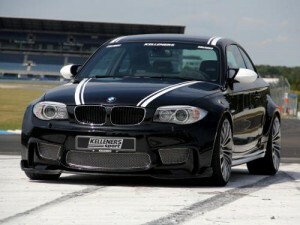 They got a BMW 1 Series M Coupe and enhanced it both visually and mechanically. So this good-looking car gets big power and that means it’s more fun to drive and a helluva lot faster then the base car, which itself is a brilliant machine. The high-revving inline six-cylinder engine with twin-turbochargers boosts the output of the KS Power SW 35M by a good 20 percent. Instead of the standard 340 hp (250 kW), the KS1-S produces max. 410 hp (301 kW) while max torque jumps from 450 to 550 Nm. The aerodynamic components of Kelleners Sport are designed to minimise wind resistance and ensure maximum down-force at high speeds. The MS front spoiler lip and the three-part MS grill insert made of electro polished stainless steel underscore the aerodynamic qualities of the car and create a supplementary visual impact.As for the wheels you get At the front, the 9×20-inch wheels are fitted with 245/30 high-performance tyres while the rear axle comes with 10×20-inch wheels and 265/30 tyres. A fantastic interior kit with Alcantara and white gloss accents finish off this fabulous package.